Showin' a little leg. - You don't know me. hehe... It's a distinct possibility. ;) Good fodder for caption contests there. Are these the legs that launched a thousand ships? "Still having trouble with the whole 'leaning' thing Oscar? Keep working on it." It looks like the camera man caught the guy in an awkward time. like his legs were stuck that way and he was trying to make it look like he did it on purpose. lol. What do you mean? This is my casual pose. 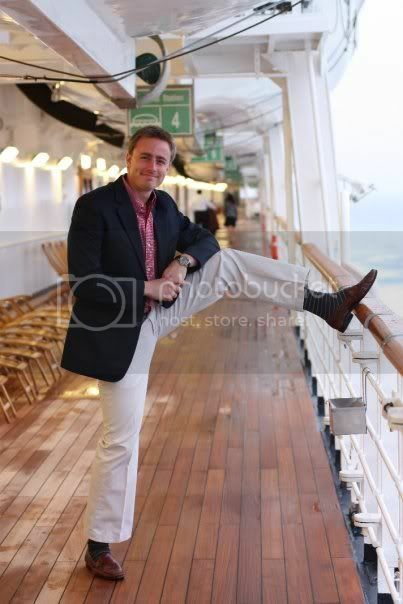 "Yes, you too can have socks like these for FREE if you book your cruise before September 15. It's our limited time 'Socks at the Docks' offer, where you get a free pair of socks at every dock. Available on 3, 5, and 7 day cruises. Offer subject to change without notice. Taxes not included. All rights reserved. Offer void where prohibited. illustrations are slightly enlarged to show detail; any resemblance to actual persons, living or dead, is unintentional and purely coincidental. No substitutions allowed. Offer valid for a limited time only. Quantities are limited while supplies last. Limit one pair of socks per person per port. Not liable for damages arising from use or misuse of socks. Other restrictions may apply. Call for details." i actually laughed out loud. nice. And just be happy I'm not wearing 70s running shorts. ♥ I hope all is well with you! "Great, now I'm stuck. This crazy gluge on the shoes thing really must stop." "I said use CrazyGleam on the handrails, not CrazyGlue!!" Haha, I actually tried to see if there was such a web address. You rock. "Don't worry about the ship capsizing, just try to look natural." And he waves back. Thanks darlin'. Caption: "I love my socks! Aren't they pretty?"